There is a large and growing body of excellent material on the use of technology to engage digital natives in the classroom. But one thing I have learned over the past few years is that a student who is very comfortable with digital technology is not necessarily digitally literate. A student can spend twelve hours a day online but still not know how to run a sophisticated Google search or post a video, not to mention build a website or script an algorithm. A student who knows how to update her Facebook status does not necessarily know how to navigate the back end of a blog or find an article on JSTOR. This does not mean that the high-tech classroom is a misguided endeavor – exactly the opposite. It means that educators have to work especially hard to guide students through the digital realm. We have an obligation to teach digital literacy. And since the best way to learn is by doing, I’ve been experimenting with new technologies for a while. I’d like to share the results of some recent tinkering. This is the story of my runaway class. Last year I taught a course entitled “Slavery and Freedom in Early America.” The course is designed to be both chronological and accumulative. Beginning with Pre-Columbian slavery, it dwells on the wide spectrum of captivity and servitude under colonialism, the transition to African chattel slavery, the rise of antislavery movements, and revolutionary politics. It ends in 1830 with the third edition of David Walker’s Appeal…to the Coloured Citizens of the World. It is not so much a supplement to the traditional early American survey as an attempt to re-narrate the entire period from a substantially different perspective. Each week students are exposed to original documents coupled with the work of a professional historian. And each reading highlights different themes and interpretive strategies. The goal is to be able to marshal these different modes of interpretation to build a multifaceted view of a particular topic, culminating in a final research project. Drawing on various active learning techniques, I attempted to make the course as dynamic as possible. We had a group blog for weekly reading responses, research prospectuses, and commentary. The blog also served as a centralized space for announcements, follow-ups, and detailed instructions for assignments (at the end of the semester I used the Anthologize plugin for WordPress to compile the entire course proceedings in book form). There were a plethora of digital images and videos, student presentations, peer instruction, and peer editing. We had a really fun, if somewhat chaotic, writing workshop speed date. We used Skype to video conference with the author of one of the required textbooks. We dug through various digital databases and related sites. We even grappled with present-day slavery through Slavery Footprint (an abolitionist social network not unlike the Quaker networks of the eighteenth century). Almost every week I asked the class about their definitions of slavery, and it was fascinating to see how they changed over time. Things really got interesting one day when I surprised them by asking them to define “freedom.” Their answers gave me a lot to think about long after the course had ended. I’ve posted the full syllabus here. One student found an ad for an escaped slave named Romeo, “about twenty-four years old, five feet six inches high, and well proportioned; his complexion a little of the yellowish cast.” Romeo was literate and “exercised his talents in giving passes and certificates of freedom to run-away slaves.” He ran off with a woman from a different county, “a small black girl named Juliet.” Another student found a convict with “a great many Letters and Figures on his Breast and Left Arm, some in red and some in black.” He was imprisoned in England, shipped to Virginia as a bond slave, escaped, traveled back to London, was recaptured, convicted, sent back to Virginia, and escaped again. 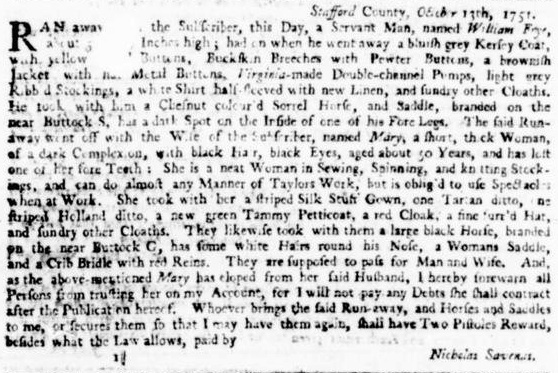 Some students found notices of hapless travelers who had been captured and deposited in prison on suspicion of being a runaway, such as Thomas Perry, a Welshman, who could provide “no certificate of his freedom.” I also shared one of my personal favorites, a servant who eloped with his master’s wife on a pair of horses. The students posted their ads to the course blog, and when they arrived for the following class I divided them into small groups. After some preliminary remarks, I asked them to choose an ad among the ones they had found and to write that person’s biography. This was an experiment in generative scholarship, not unlike Visualizing Emancipation or the super-neat History Harvests at the University of Nebraska. But my class was much more narrowly defined in time and scope. The students had to use their wits, their laptops, and all of the contextual information they had accrued from the readings and discussions in previous weeks. They had to build a plausible narrative for their runaway on demand, with no warning, no excuses, and no template. I circulated among the groups to monitor progress and occasionally offered questions or assistance. The questions we asked were the typical ones employed by historians. What can you find out about Romeo and Juliet’s purported owners? What does the date tell you? What was going on in that location at that time? How many women ran away from their husbands in New York City in 1757? Was it unusual for servants to escape in groups of three or more? Did the time of year matter? How does the price offered for one runaway compare to others? What can you learn from their detailed physical descriptions? What about their profession? What about the lists of items they took with them on their journey? Is this information reliable? What governed decisions to escape or to stay? What, if anything, does this tell you about the relationship between petit marronage and grand marronage? How does this information comport with what we know about slavery in a particular place and time? It’s shocking how much information you can glean about a person’s life after just a few minutes online, even persons who have been dead and gone for hundreds of years. The various newspaper databases – Readex, Accessible Archives, Proquest – and specialized projects, such as The Geography of Slavery in Virginia, proved invaluable. I directed students to the large collection of external databases featured on the Slavery Portal. Genealogy sites and historical map collections also came in handy. One student discovered that his subject had escaped from the same slaveholder multiple times at different points in his life. Using the Trans-Atlantic Slave Trade Database, we were able to locate the name of the ship that had carried an individual and their likely point of origin in Africa. Students from different groups helped each other, which created a nice collaborative atmosphere. Sometimes there were dead ends, a common name or a paucity of leads. But even then the student could surmise, could use her imagination based on what she already knew about a particular time and place. And this was one of the goals of the exercise – to expose the central role of the imagination in historical practice. At the end of class, we shared what we had discovered and were able (briefly) to engage some big sociological questions about the lives and labors of colonial runaways. When I polled the students at the end of the semester about the most memorable moments of the course, the runaway class was their favorite by a wide margin. The final evaluations were among the best I have ever received. There are aspects of this crowdsourcing experiment that I regret. I had hoped at least some students would take inspiration from the material for their final projects, and I’m sure some of the lessons from that day improved their papers. But because I scheduled the runaway class late in the semester, the students were reluctant, I think, to radically revise their project proposals. Of course, if I had run the class too early in the semester, the students would not have had the necessary background to make educated inferences about their subject. There were other snags. Because most students were not familiar or comfortable with the vast range of digital research tools out there, I had to do some hand-holding and gentle nudging. It was clear that my students needed more experience finding, using, and interpreting large online databases, not to mention Google Books, Wikipedia, Zotero, and other tools historians use every day. It might even make sense to run in-class tutorials on what researchers can do with a database like Colonial State Papers, Fold3, or Visualizing Emancipation. A large part of being an historian is just knowing what source materials are out there and how to turn them to your advantage. I also regret not taking more detailed notes. In part because everything moved so fast, I was left without a finalized version of the students’ many fascinating discoveries. There was a lot of research and sharing going on, but not a lot of synthesis and reflection. I suppose asking the students to follow-through and actually write their speculative biographies would help. Maybe that would be a good midterm assignment? If I ran this course for years, I could easily see building a massive online database of runaways and their worlds, on a national or even international scale. In the end, the runaway class was an object lesson in the raw energy and potential of digital history. It was interactive, immediate, and exciting. I would be interested to know if anyone has run a similar experiment or has suggestions for different ways to liven up the classroom. Great post. Inspirational. I’m teaching “Slavery and Emancipation” as a new upper division course this semester as well. And we used The Geography of Slavery, of course, and the Transatlantic Slave Trade database to do many of the same things you are having your students do. I have been using the 300 level courses here less to build generative scholarship than to work with students to navigate and interrogate scholarly digital projects and collections, so that they approach these sources critically and understand something about how they have been composed in digital form. I have been asking these students to post discussion blog posts specifically on aspects of the evidence they find and engage with in these digital projects. We need, I think, to be building digital history projects rigorously into our teaching and curriculum, so it is nice to see you doing this so effectively. While my current class is too large in size to do some of what you are doing here, you have located the “raw energy and potential of digital history.” It’s what I continue to find most exciting about digital history. Thanks for the nice reference to The History Harvest! I think you’re right. The best way to engage with digital history is to practice what we preach and put it right at the core of the curriculum. I’m a huge fan of the History Harvest.